First Appearance: Whiz Comics #2 (Feb. 1940): "Introducing Captain Marvel"
DC Heroes Secret Files & Origins #1 (Feb. 1999): "Spies Like Us"
DC/Marvel All Access #1 (Dec. 1996): "The Crossing!" Genesis #2 (Oct. 1997): "Edge of Destruction"
Genesis #3 (Oct. 1997): "Event Horizon"
Genesis #4 (Oct. 1997): "Last God Standing"
JSA #52 (Nov. 2003): "Brand New Day"
Justice League (vol. 1) #1 (May 1987): "Born Again"
Justice League (vol. 1) #2 (June 1987): "Make War No More!" Justice League (vol. 1) #3 (July 1987): "Meltdown"
Justice Society of America (vol. 3) #23 (Mar. 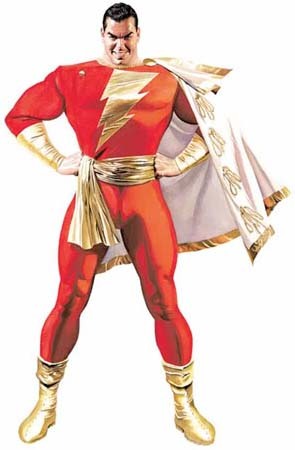 2009): "Between a Rock and a Hard Place, Part One: The Power of Shazam"
Justice Society of America (vol. 3) #24 (Apr. 2009): "Black Adam & Isis Part Two: Family Ties"
Justice Society of America (vol. 3) #25 (May 2009): "Between a Rock and Hard Place (Part III): Family Feuds"
Last Days of the Justice Society of America Special (1986): "The Last Days of the Justice Society"
Legends #1 (Nov. 1986): "Once Upon a Time...!" 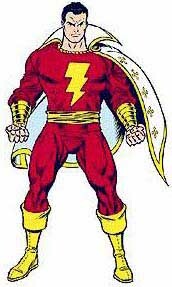 Marvel Family #1 (Dec. 1945): "The Marvel Family and Baby Marvel"
Marvel Family #28 (Oct. 1948): "The Asteroid Adventure"
Master Comics #21 (Dec. 1941): "The Coming of Captain Nazi"
The Power of Shazam! #14 (Apr. 1996): "Chain Lightning"
The Power of Shazam! #25 (Apr. 1997): "The Times are Changing"
The Power of Shazam! #26 (May 1997): "Hero Falls"
The Power of Shazam! #27 (June 1997): "The Tenants of Time"
The Power of Shazam! #29 (Aug. 1997): "The Great Carlini"
The Power of Shazam! #48 (Mar. 2010): "Rest in Peace"
The Power of Shazam! #1000000 (Nov. 1998): "Between the Rock and a Hot Place"
The Power of Shazam! Annual #1 (1996): "True Believers"
Whiz Comics #2 (Feb. 1940): "Lucky Seven Cash Contest"